Over the years I have followed many producers in Piedmont and as the succession of great vintages has rolled along in Italy, so has the gradual increases in price that place many of these producers beyond my ordinary wine budget. Fortunately, some producers have remained a relative value and among them, Brovia stands apart. Brovia is an old (originally founded in 1863), family owned winery with several stunning wines. The family owns approximately 46 acres in Castiglione Falletto and Serralunga d’Alba in the heart of Barolo. Their primary vineyards are: Rocche (Castiglione Falletto), Villero (Castiglione Falletto), Garblèt Sue’ (Castiglione Falletto) and Ca’Mia (Serralunga d’Alba). The breakdown of grapes cultivated is: Nebbiolo da Barolo 55%; Dolcetto d’Alba 25%; Barbera d’Alba 10% and others (Nebbiolo da Barbaresco, Nebbiolo d’Alba, Freisa, etc.) 10%. Guaranteed continuity in quality wine making thanks to the academic background and experience of the new generation. 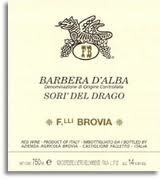 I recently picked up a six-pack of the 2009 Barbera d’Alba Sori’ del Drago – wow, what a wine! At an average retail of $28.99 per bottle it is not cheap Barbera, but the wine is heavenly and well worth the investment. Tight nose with black cherry, cedar and nutmeg hints – lovely. Medium-bodied with moderate acidity and firm tannin – well balanced. Dark fruit core with rich cocoa, tobacco, violet and allspice notes – incredibly complex. Long finish – layered and smooth. Drinking well now and should improve with another 5 to 7 years in bottle. Magnificent wine. Puglia, or Apulia in the Italian, is a region in the south of Italy that makes up the “heel of the boot.” Its geography and agricultural wealth made it a desirable spot in ancient times. First settled by the Illyric peoples, the area was quickly conquered by the Mycenaean Greeks during the 8th Century BC. The Greeks expanded their holdings into what was to become Magna Graecia, making the region a center of commerce. Successive conquests by the Samnites, Carthaginians, and then Romans only increased the importance of the region on eastern province trade. Throughout its rich history, wine making has always been a fixture in the area. Working with a combination of transplanted grapes (via Greece) and native varietals, winemakers in Puglia produce some of the most interesting wines in Italy. Oftentimes the wines don’t get the respect they deserve, largely because they are even less recognizable than their more famous Italian compatriots. At a dinner recently we had the first of the these two wines – a lovely, gutsy red whose name stems from the varietal blend – Ne(groamaro)pri(mitivo)ca(bernet sauvignon) – clever… Whatever – the wine is a tremendous value, in, yes you guessed it… 2009. 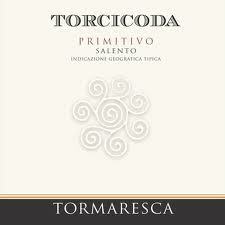 The second wine is the older brother to the Neprica – 100% Primitivo-based wine that is just wonderful. Jammy nose with dark fruit and earthy hints. Medium-bodied with moderate acidity and supple, chewy tannin – good balance. Bright cherry palate with violets, truffles and tar notes. Moderate length – smooth. Drinking well now and should hold for another 2 to 3 years in bottle. Great value. Perfumed, floral nose with cherry, allspice and black pepper – pretty. Medium-bodied with moderate acidity and firm tannin – well balanced. Dark fruit core with menthol, cherry and anise notes. Moderate length with a smooth, layered finish. Drinking well now and should improve with another 3 to 5 years in bottle. Good value. Bright, perfumed nose with spice, cherry and floral hints. Full-bodied with moderate acidity and moderate tannin – good balance. Earthy, rustic palate with sour cherry, cedar and tobacco leaf notes. Moderate length – smooth with black pepper and mint on the aftertaste. Drinking well now and should hold for another 2 to 3 years. Jammy, spicy nose with blackberry, blueberry and black pepper hints. Full-bodied with moderate acidity and supple tannin – well balanced. Dark fruit core with lush, plumy overtones – cedar, cocoa and tar. Long finish – smooth and seductive. Drinking well now and should hold for another 2 to 3 years in bottle. Good value. I miss good old-fashioned Zinfandel… Back in the late 80’s, I fell head-over-heels for Dry Creek Zin. The wines were expressive and spicy with enough structure to give the wines presence without being overpowering. Producers like Alderbrook, Quivara, Mazzocco, Ravenswood, Pedroncelli, Ridge, Rosenblum and Seghesio were making some terrific wines at really reasonable price points. It’s been a while since I’ve enjoyed Zinfandel as much as I did back then. Most of the problem is that Zinfandel has become a caricature of itself. Massively fruity with prodigious alcohols often approaching 15%, the wines lack finesse or expression, often playing the loud mouthed boor… Pass. There’s always hope… While on a buying trip I scooped up the Pezzi King Dry Creek Zinfandel and was pleasantly surprised. The wine is reminiscent of old-fashioned Zinfandel – a mélange of flavors with just the right balance of strength, refinement and finesse and at an average retail of $19.99 it won’t break the bank. So, if you pine for old-fashioned Zin, keep your eye open for Pezzi King – you will not be disappointed. Intense, jammy nose with blackberry, lilac and curry powder hints – wild. Full-bodied with moderate acidity and firm, well-integrated tannin – good balance. Ripe, youthful palate with red berry and cooked fruit notes – pretty. Moderate length – smooth with a seductive finish. Drinking well now and should hold for another 2 o 3 years in bottle. Beaujolais… For many wine lovers, Beaujolais connotes simple, easy-drinking red wines, served slightly chilled and never taken too seriously. Especially not the Nouveau wines that arrive every November on the third Thursday, just before Thanksgiving, ravenously guzzled and soon to be forgotten. Hmm… I drink Beaujolais when I need a break. When my palate is tuckered out from being blasted by uber-tannic monsters, or over stimulated by the “wine of a thousand flavors,” I turn to Beaujolais. That is not a slight, but most of the time Beaujolais is just plain old wine. Then comes a vintage like 2009 and Beaujolais is anything but plain old wine. Anyone who has read my blog or merely stood within earshot of me should know by now that the 2009 vintage in Europe is a fantastic vintage. Everything I put to my lips screams “buy me!” I had been reading a lot about 2009 and Beaujolais and figured I ought to taste a few. So far the one’s I’ve fallen upon have been tremendous wines. To the uninitiated, Beaujolais is a very simple appellation to understand. Basically you have Beaujolais, Beaujolais-Villages and ten Cru Beaujolais AOC’s. 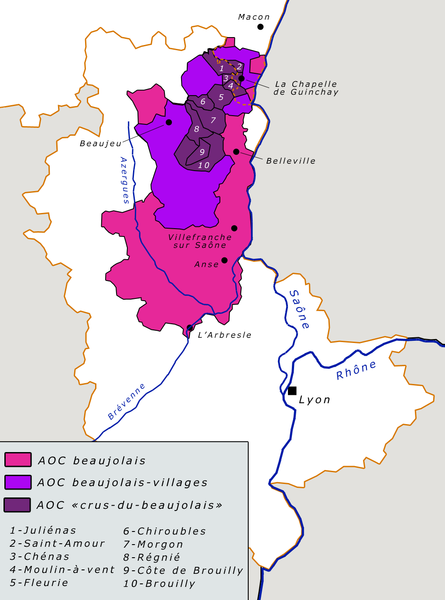 The ten Cru Beaujolais regions (from south to north) are: Brouilly, Côte de Brouilly, Régnié, Morgon, Chiroubles, Fleurie, Moulin-à-Vent, Chénas, Saint-Amour, and Juliénas. That’s it – no multitude of vineyards to memorize, no complex set of classifications to pour over, nothing… The other easy piece of the equation is that 99% of all wine produced in Beaujolais is red and that all red wine is produced from the Gamay grape. The miniscule percentage of white is usually always Chardonnay (although Aligoté is allowed). The four wines below are a start… I plan on continuing to seek out 2009 Beaujolais – they’re fun, easy to drink, relatively easy on the budget and in 2009 severely undervalued. Ripe, fresh cherry nose with gamey and floral hints – lovely. Medium-bodied with moderate acidity and supple tannin – good balance. Fresh, lively palate – lush fruit, jammy. Moderate length – smooth and quaffable. Drinking well now and should hold for another 2 to 3 years. Great value! Minerally nose with fresh cherry, rosemary and violet hints. Medium-bodied with moderate acidity and supple tannin – good balance. Sour cherry palate with black currant and banana chip notes. Moderate length – smooth – infinitely gulpable. Drinking well now and should hold for another 2 to 3 years. Ripe cherry nose with violet and mineral hints. Medium-bodied with moderate acidity and supple tannin – good balance. Dark fruit core with black cherry, tar and rose attar notes – almost brooding. Moderate length – smooth with a bit of layered complexity. Drinking well now and should improve with another 3 to 5 years in bottle. Bright cherry nose with wet stone, violets and allspice hints. Medium-bodied with moderate acidity and supple tannin – good balance. Tart palate with cherry, tea leaf and vanilla bean notes. Moderate length – smooth, but a bit tight – structured. Drinking well now and should improve with another 2 to 3 years in bottle. Good value. Several years ago we made a trip down the east coast, stopping along the way to visit local wineries. As you might expect this is a frequent pastime of ours and this time we came home with a treasure trove of really nice wines. Among some of our favorites were wines from a quaint winery in New Jersey called Valenzano Winery (http://www.valenzanowine.com/). Valenzano Winery takes pride in producing affordable, high-quality wines, using all local produce, which demonstrates the true potential of New Jersey’s burgeoning wine industry. During our visit we got to meet Tony and Mark Valenzano, who along with father Tony Sr., are the engine behind this eastern wine making dynamo. At the time of our original visit (2005) we brought back a selection of vinifera and non-vinifera wines, a few of which we put in our recent Wines of North America tasting. The wines showed really well, despite being several years old, which for me validated what I had thought at the time of purchase: these were well-made, age-worthy wines. I sent a note to Tony and Mark to let them know how well their wines were doing and the next thing I knew, we were the happy benefactors of a few of their latest wines. A small group of Musings stalwarts came together to blind taste the wines – here are my tasting notes, as well as impressions from the group. Bright, fruity nose with black cherry, blueberry and vanilla hints. Medium-bodied with moderate acidity and moderate tannin – good balance. Dark fruit core with tobacco leaf, tar and cocoa notes. Long finish, smooth and layered with a hint of tart cherry. Drinking well now – should hold for another 2 to 3 years. This wine was a favorite of the group – most agreed that it was the most easy drinking, pleasant wines of the grouping. Tight nose with menthol, eucalyptus and black cherry hints – very pretty. Medium-bodied with moderate acid and firm, dry tannins – well balanced. Dark fruit core with blackberry, tar, tobacco and cedar notes. Long finish – tight – drinking well – should improve with another 3 to 5 years in the bottle. Quite Bordeaux-like – excellent. This wine was another favorite of the group – folks felt this wine needed time to open. Perfumed nose with cherry, floral and spicy hints – lovely and enticing. Medium-bodied with moderate acidity and dry tannins – good balance. Sour cherry palate with tart, leathery notes. Moderate length with cedar, raspberry and tea flavors on the aftertaste. Drinking well – will likely not improve further – lacks a bit of fruit. Least favorite of the group – most felt the wine was a little tired and lacked fruit and the vibrancy of the first two wines. Fruity, peppery nose with black currants and balsam hints – a bit medicinal. Full-bodied with moderate acidity and supple tannins – good balance. Black cherry with a candied sweetness on the palate – burnt orange rind hints. Moderate length with a smooth, luxurious finish. Drinking well and may improve with more time in the bottle. Remarkably well put together fortified wine. Either loved or hated, depending on one’s personal style preference. 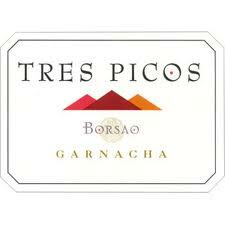 Overall, the high quality and modest price point of these wines makes them quite attractive and appealing. A perfect example of great wine making outside of the west coast! Sicily is a land of incredible beauty with a long, storied past. As an island off the toe of southern Italy, possessing idyllic conditions for growing the essentials of the Mediterranean diet, Sicily has been home to many cultures, all of which made wine. Sicily is also home to Mt. Etna, Europe’s most active and tallest volcano, which has erupted five times over the last year alone (2011). The 500,000 years of volcanic activity has created one of the most fertile agricultural valleys in Italy, if not the world. Another feature of all this volcanic activity is an incredible variety of soil types, leading to high variability in terrior, even on the same hillside. Enter Marc de Grazia, one of Italy’s most revered wine exporters with a knack for finding some of the most interesting wines to send back to the US. In Sicily, Marc has gone one step further and is actually making the wine from an ancient region: DOC Etna. Terre Nere is the name of this venture and one that you should get to know. Vinification at the winery is classic Burgundian in style, which shows in the bright, ruby red color and lively red fruit flavors. The vineyards are located at extremely high altitudes, ranging from 2,000 – 3,000 feet above sea level. The weather at such high altitudes – hot direct sunlight with cool shade and cold nights – contributes to the extraordinary finesse of the wines, missing the heat and overripe sensations that overwhelmingly define most Southern Italian wines. 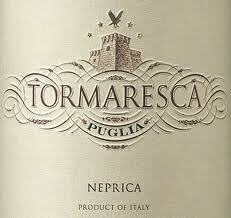 A portion of Terre Nere’s vines are pre-phylloxera; the rest are about 50 years old. The trellising is “en goblet” or self standing, like the vineyards in Central Spain. The grapes, Nerello Mascalese (98%) and Nerello Cappuccio (2%) are harvested at the end of October (making it the second to last harvest in all of Italy, after Aglianico), which is a risky proposition but one that yields superior results. The 2010 Rosso is lovely wine, which at an average retail price of $21.99 per bottle is quite a bargain. Lightly fruity nose with floral, chalk and dried herb hints. Medium-bodied with moderate acidity and firm, dry tannin – good balance. Red berry palate – fresh and lively – fruity and spicy with fresh raspberry notes – elegant. Moderate length – smooth with flecks of black pepper and allspice. Drinking well now and should hold for another 2 to 3 years in bottle. Charming. A principal factor in teaching about wine is the primary distinguishing characteristic between old and new world wines: Old world wines almost always emphasize “place of origin,” whereas new world wines almost always emphasize the “grape varieties” in the wine. I subscribe neither good, nor bad attributes as a result of this difference, it just – is. It’s important to note, though that this difference has been the rallying cry for many wine makers in Italy, especially those in Tuscany seeking a better product, who for decades railed against the law to produce what are known as “Super Tuscan” wines of peerless quality. Bending, or changing the rules was simply not the case in Tuscany, nor anywhere else in Italy for that matter. This devotion to the rules, which is eerily Catholic in its reverence to the local consorzio del vino, drove many fine wine makers to strongly support the passage of the Indicazione Geografica Tipica, or IGT classification in 1992. As I said, the rigidity of Italian wine law was not only the bane of the poor folks in Tuscany, every other region suffered, including the Veneto. Enter the Allegrinis, a long-standing family whose tradition and connection to the Valpolicella region dates back to the 16th century. Franco, Marilisa and the late Walter Allegrini inherited the mantle of fine wine production from their late father Giovanni, long considered one of the best wine makers in Italy. Deeply rooted in the traditions of Valpolicella, the Allegrinis knew the importance of innovation when it came to producing world-class wine. I fell in love with my first bottle of Palazzo della Torre with the 1985 vintage. The wine was spectacular – complex with seemingly infinite layers of flavor that left me in awe. At that time the wine was classified as a DOC Valpolicella Classico Superiore. I continued to enjoy the occasional bottle now and then, but follow-on vintages lacked the magic of that 1985. The patriarch of the family, Giovanni passed away suddenly in 1983 and Franco, Marilisa and Walter picked up the reins. From the start, this new triumvirate felt that the wine could be better, but the constraining rules for membership in the Valpolicella DOC preempted perfection. 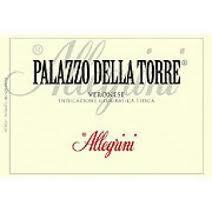 Finally, after years of not being able to adapt the laws to accommodate a more innovative approach to Valpolicella, Allegrini broke from tradition and declassified the Palazzo della Torre from DOC Valpolicella status to Veronese IGT in 1997. At the time, the claim was that stifling wine laws prevented the family from making the best wine possible, so they sought refuge in the less-confining IGT classification. With the IGT, Allegrini was free to experiment with the inclusion of different grape varieties, different blended concentrations and less traditional vinification techniques. The strict requirements imposed by the place of origin that was Valpolicella. By 1997, Palazzo della Torre had become a stalwart of quality, so there was no real concern that the change in classification would impact its popularity. The ensuing decades have reinforced the correctness of this assumption. Personally, I re-embraced an annual purchasing strategy starting with the 1997 vintage, noting that the 1999, 2001, 2003 and 2005 were all fantastic wines. As an aside, The Wine Spectator included the 2008 vintage on its most recent Top 100 list. I’m not surprised. The most recent vintage I sampled is the 2007 and I can safely say that it is upholding this wine’s fine reputation. The 2007 wine is a charming blend of 70% Corvina Veronese, 25% Rondinella, and 5% Sangiovese, grown on the mostly clay and chalk soils of the Palazzo della Torre vineyard in Fumane di Valopolicella. The vineyard is approximately 64 acres (26.39 hectares) and was planted between 1962 and 1989, and employs the Pergola Trentina trellising system. The grapes are harvested by hand in two waves. During the second fortnight of September, grapes selected for drying, ala Amarone are harvested. During the second fortnight of October, grapes that are to be vinified immediately are harvested. The first wave of grapes are dried until January, then de-stemmed, pressed and vinified. The second wave of grapes are de-stemmed, pressed and vinified immediately after harvest. Fermentation takes place in temperature controlled stainless steel tanks with full Malolactic fermentation to soften the wine. Each wine is aged for 15 months in second-use oak barriques, blended together for another 2 months and then finally bottle-aged for a remaining 7 months. The process is akin to the Vino Ripasso style, except in the case of the Palazzo della Torre, the wine is a blend of actual Amarone-like wine, instead of merely resting on the lees of Amarone wine for several months. Perfumed nose with dried fruit, spice and floral hints – lovely. Medium-to-full bodied with moderate acidity and firm, dry tannins – well balanced. Jammy palate with raisin, blackberry and dark chocolate notes – Wow! Long finish with spicy complexity – smooth. Drinking well now and should improve with another 3 to 5 years in bottle – great value. The late Andre Iche was a pragmatic wine maker. He was the first wine maker in Languedoc to break away from the traditional cooperative model of wine making and found his own winery, with his own grapes. While not considered maverick behavior today, several decades ago this was heady stuff… Alas, Monsieur Iche is no longer with us, but his family has carried on his tradition and is continuing to make fine, value-priced wine in Minervois. I started my relationship with Château d’Oupia wines in the late 80’s, I think my first vintage was 1994 and I religiously bought the wine for successive years until about 2001. I lapsed a bit, tasting the 2003, 2005 and 2007 vintage, but only buying token amounts because the wine really didn’t “speak to me.” Then came the 2009 – There are few words to describe this wonderful wine, but the ones that rush out of my mouth are Yummy and Wow… At an average retail price of $11.99, this wine is a monumental value. 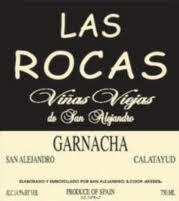 My best sources indicate that the wine consists of 60% Carignan, 30% Syrah, and 10% Grenache. Ripe, fruity nose with cherry, currant and floral hints. Medium-bodied with moderate acidity and moderate tannins – Good balance. Youthful, red berry fruit with tar and blackberry jam notes – Wow! Moderate length, simple, smooth and infinitely quaffable! Drinking well now and should hold for another 2 – 3 years of aging. Superb value!